The value of travel: With its event entitled Perspektivwechsel (Change of Perspective) at Berlin’s Kulturquartier silent green, the Goethe-Institut provides insights into the diversity of its worldwide residency work. The international scholarships for artists create mutually enriching dialogues. Klaus-Dieter Lehmann is convinced that Goethe would have been the ideal grantee of an artist’s residency. After all, the writer of the West-Eastern Divan was a declared friend of encounters with other cultures and learning through travel. He was also the one who said, “The existence of foreign peoples is the best mirror in which we can recognize our own.” In his speech at Berlin’s Kulturquartier silent green, Lehmann, the president of the Goethe-Institut, recalls this philosophy of its namesake. 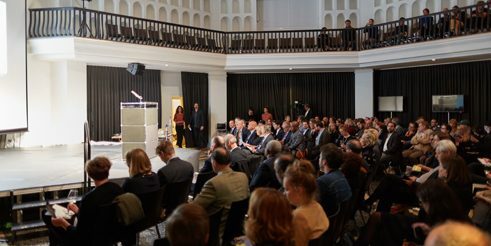 Here, the worldwide residency work of the Goethe-Institut is being presented to 200 guests at an event entitled Perspektivwechsel (Change of Perspective). In cooperation with the Foreign Office and cultural partners abroad, the institute enables about 130 stays by artists and academics every year in nearly 50 programmes on several continents. 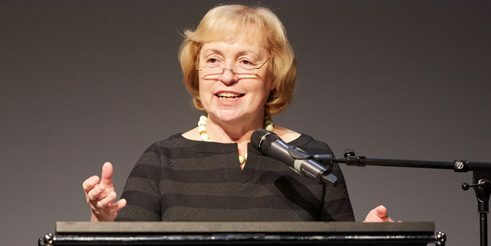 The scholarships promote exchange, create lasting networks and set the “cultural policy tone abroad and in the host country,” according to Lehmann. “Solutions are not found in global formulas, but in personal encounters and experiences that lead to learning communities.” The residencies are therefore not “Arcadian retreats,” but “base camps for artists and intellectuals,” he continues. 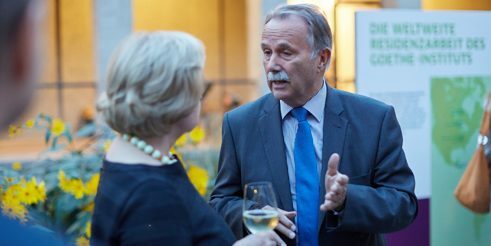 President Klaus-Dieter Lehmann speaking with Minister of State Maria Böhmer. | Photo: Bernhard Ludewig “Only dialogue can make it possible for us to attain a peaceful coexistence,” says Maria Böhmer, Minister of State at the Foreign Office, stressing the importance of the usually three-month stays abroad. She likes what the writer Lucy Fricke, a 2011 resident at the Villa Kamogawa in Kyoto, once said about her time in Japan: “The sponge principle prevails: Soak and squeeze.” Whereby we should understand “squeeze” as the long-term ability to draw on the experience gained. The focus of the Perspektivwechsel programme is on two residency venues. One is the Tarabya Cultural Academy in Istanbul with its seven artists’ suites operated by the German Embassy in Ankara and curated by the Goethe-Institut. The other is the above-mentioned Villa Kamogawa, which lies picturesquely between the Imperial Palace and Kyoto University and is presently celebrating its fifth anniversary as a residency location. The worldwide number of residency locations is constantly growing. In November 2016, Goethe president Lehmann also points out, the Villa Sul will open in Salvador-Bahia, Brazil. It will focus primarily on the “Global South” and be open to German as well as international residents. There are also definite plans to set up a “German Academy” with up to 15 residencies in New York City in the former headquarters of the Goethe-Institut on Fifth Avenue, across the street from the Metropolitan Museum of Art. 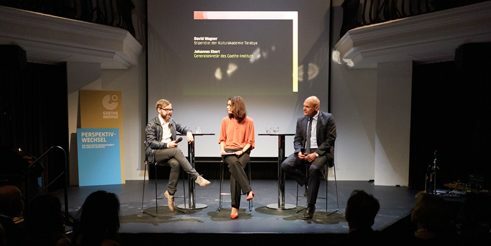 Writer David Wagner, moderator Amira El Ahl and the secretary-general of the Goethe-Institut, Johannes Ebert, in conversation. | Photo: Bernhard Ludewig In 2004, during his time as director of the Goethe-Institut in Cairo, Ebert launched a writer-in-residency project. It taught him what “strong reflection about perceptions of the foreign” it made possible. The cultural programme at silent green reveals how the residencies, which are not directly goal-oriented, can translate artistically. 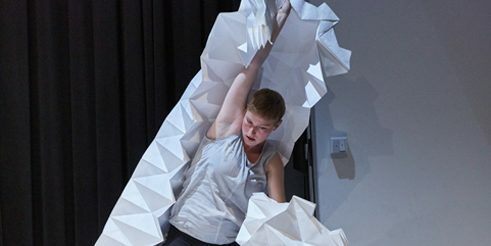 The dancer and object artist, Antje Töpfer, a 2015 resident at Villa Kamogawa, shows scenes of her play 3 Akte. In Japan she studied a special kind of origami and performs a character-rich performance with an intricately folded roll of paper. 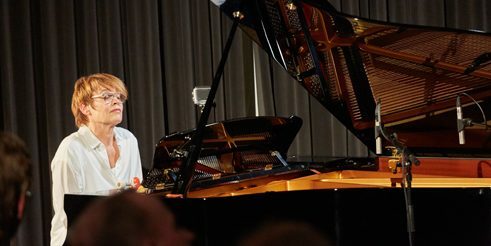 The musician Ulrike Haage also found plenty of inspiration in Kyoto in 2012 and “let the ideas for a composition grow while walking,” as she says. Excerpts from her piano cycle For All My Walking offer impressions of it. In addition, the residency promoted a partnership with the director Doris Dörrie, for whose film Greetings from Fukushima Haage wrote the music.